Also, it was published 45 years ago this month…in its turn 21 years after the folding of Unknown Worlds, in it's turn founded 70 years ago, with much nostalgic and not so nostalgic reminiscence in editor D.R. Bensen’s introduction, who notes that in the US-still-neutral WW2 years, the ads in Unknown and other fiction magazines lent themselves to suggesting ways to keep that $30/week job, rather than such late 1963 concerns as nuclear war (the introduction was clearly written before the Kennedy assassination). Today, of course, we’re much further along, and often most concerned with keeping that $600-900/week job. Unknown, of course, was the fantasy-fiction companion to the hugely influential sf magazine Astounding, as mentioned in previous posts, and during its 3.5-year run it was the other major pole in fantasy-fiction publishing in the pulps and pulp-like magazines to the similarly legendary Weird Tales (in Unknown Worlds's later years, it was published in a larger size and with better paper than the pulps, with a fairly staid cover format that looked more like The Atlantic Monthly at the time than like the pulps…all factors which might’ve led to its folding in 1943, when paper supplies were getting tight and publisher Street and Smith cut back on several fronts.) Actually, 1939, when Unknown was founded, was a good year for fantasy magazines, with Ziff-Davis first offering Fantastic Adventures (though it was originally primarily a science fiction magazine), the Thrilling Group/Standard Magazines launching the shortlived Strange Stories, and the Munsey magazine group beginnin Famous Fantastic Mysteries, primarily a reprint magazine but publishing some notable original fiction. But in the early ‘40s, the post-Lovecraft/Robert Howard/Clark Ashton Smith Weird Tales and Unknown were the most prominent titles devoted exclusively to fantasy. It’s often been thus since—when Unknown folded, both WT and eventually Fantastic Adventures gained new, good contributions and contributors…even if the latter never completely shed hack adventure fiction cheek by jowl with the better work. When WT folded for the first time in 1954, The Magazine of Fantasy and Science Fiction had arisen beginning in 1949 and continuing to the present, while FA was folded into the more ambitious new Fantastic in 1954…though, unfortunately, the tendency toward hack was simply transferred over to Fantastic for the next several years (the notable Beyond Fantasy Fiction sprung up for its run from 1953-1955 as a companion to Galaxy Science Fiction). However, F&SF and Fantastic remained the most visible and consistent markets for new fantasy till Fantastic’s first run ended in 1980 (it was merged with its sf stablemate Amazing Stories, and has been revived spottily since). Which is a long way ‘round to get to the news that F&SF, now in its 60th year, is dropping frequency to bimonthly status for the first time since the early ‘50s, and that Realms of Fantasy, which has held that “other fantasy magazine" status for 15 years, has been rather abruptly folded by its publisher (April’s will be the last issue); the revived Weird Tales, probably the next most visible US fantasy magazine, seems to be continuing, even as Fantastic will supposedly be relaunched again. So, finally, to the book’s literary content, an attempt to, even more than with its predecessor The Unknown, concentrate on stories that had not been reprinted from the magazine…including a previously unpublished lead-off story by Isaac Asimov, “Author! Author!” This had been in inventory at Unknown Worlds when the magazine folded, and Asimov had never placed it elsewhere, and it's an amiable if slightly stiff tale of a writer literally haunted by his insufferable detective character, who attempts to steal his creator’s life. Cleve Cartmill, busy over several decades as a ghost-writer for the likes of Leslie Charteris and possibly Henry Kuttner, as well as under his own name (and famously at the center of a WW2 investigation of his atomic bomb story for Astounding, “Deadline”), has a clever if perhaps excessively folksy deal with the devil story with “The Bargain”…Stephen Vincent Benet or Manly Wade Wellman might well’ve done a bit better with this story…perhaps this kind of thing requires a three-name byline. 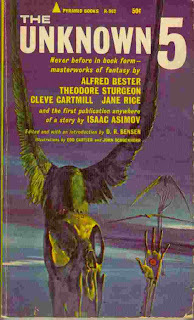 Theodore Sturgeon’s “The Hag Seleen” follows (originally published, with some justice, as by Sturgeon and James Beard [not the chef]), a good example of Sturgeon’s work for the magazine, but not among the greatest (such as “It,” considered here previously as part of Knight’s The Dark Half, or “Shottle Bop”). Sturgeon’s child characters could sometimes be a bit cute, and this is an example. Alfred Bester’s novella “Hell is Forever” might be the earliest published example of Bester’s devotion to “dazzlement” as a technique…keeping this, and such later work as The Demolished Man and “5,271,009,” moving at a breakneck pace with sudden flashes of invention and deft turns of plot. He hasn’t mastered it yet, in this tale of a Hellfire Club-like group who find themselves damned to customized private hells after they wade into deeper water than they expected…but the work is both rewarding fun and promising for what he would go on to do…including a number of other novels, the last and most purely criminous reconstructed by Charles Platt for posthumous publication, Tender Loving Rage. And "The Crest of the Wave," Jane Rice’s tale of a murdered thug’s posthumous retribution for his murder, is a good, if unextraordinary, example of that kind of borderline crime-story horror, with fine detail. In short, this gives a good sense of what a good issue of Unknown was like, if not (nor could it quite be) an example of the absolute best the magazine published. 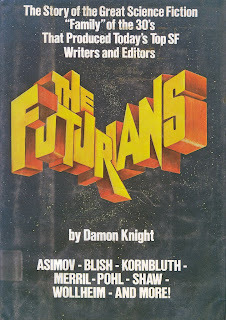 The Futurians, as the title suggests, deals with a sf fan club that managed to gather, during its existence in the 1930s into the 1940s, a remarkable number of the (eventually) more important people involved with sf in New York City at that time. Some, like Walter Kubilius and John Michel, are largely forgotten by today’s readers, and weren’t extrordinarily prolific at that time among the other budding professional writers, editors and/or illustrators in the group, albeit Michel was very influential on the thinking and aspirations of his more litearily-productive colleagues, notably Pohl, Knight, Cyril Kornbluth and Judith Merril; Kubilius was active in the Lithuanian-American community. Others, like Asimov, were relatively peripherally involved with the group (in his case in part because of the demands of helping his family with their candy store). But core and fringe membership included Wollheim, a major force in editing with Avon, Ace and his own DAW Books over the decades. as well as a fine writer; James Blish; Richard Wilson, journalist and underappreciated fiction-writer, who married Doris Baumgardt (who wrote as Leslie Perri) after her divorce from Pohl (the Futurians and the membership in later years engaged in a lot of [more or less] serially monogamous spouse trading); artist and writer Hannes Bok; writer, historian and reporter David Kyle; editor Larry Shaw; the eventual Elsie Wollheim, who would take over DAW Books during her husband's final decline, and more. A number were eventually killed by damage sustainted during WW2, including Kornbluth, due to a heart ailment he picked up, or Harry Dockweiler, who died horribly some years after a minor-seeming injury spiraled out of control (but his invalid status led Rosalind Wylie and Pohl to start a literary agency for him, which led to Pohl’s controversial and influential agency)…others were eaten up by less avoidable dangers, ranging from cancer to paranoia-driven alcoholism. Knight doesn't shrink from portraying the ugliness as well as good fortune and grace within the group, and in the decades afterward…the fact that half the sf magazines being published at the turn of the 1940s were being edited by members of the club (Pohl, Wollheim and Robert Lowndes), albeit the lower-budgeted half, and all those editors were starving, or close to. As usual of late, I’ve not enough time to explicate further, but I have to wonder what, beyond the lust inspired by photos (and casual writing fragments) of Doris Baumgardt, made this often mutually backbiting group so attractive as potential life-models for the literarily ambitious young man (old boy) that I was in 1978? 1. I can sing in four ranges, all of which are missing notes. I'm probably best at minor-key songs (bluegrass, gospel, etc.). As an instrumentalist, I'm the worst musician in my immediate family. 2. I've been paid for haiku by a magazine, or at least its editor/publisher. Albeit only once. 3. I was one of the infants given tetracycline in its early formula, in the mid-1960s, which has permanently (at least, so far) stained my adult teeth beige. They don't look rotten (nor are they), but I really should consider caps. 4. My brother, who couldn't convince his girlfriend to accompany him, once treated me to a Laurie Anderson concert in her stead. She was performing with the same patter as she did on Letterman's show the night or so before, and it wasn't that inspired the first time. My brother and I were sitting in the front row, and we might well've been the only people in the audience not to have stood to give her an ovation. She stared at us. 5. Because some college classmates of mine couldn't convince their girlfriends to come along, I was able to attend not only the first Thelonious Monk Memorial Concert, but also the reception afterward. Thus I met David Amram, Urszula Dudziak, Wynton Marsalis, and T.S. Monk III. And Gerry Mulligan; we literally bumped into each other at a buffet table, both turned around to apologize, and I then burbled, which famously was not the thing to do with Mulligan. 6. I took the Metro train into that concert in DC, but couldn't get my Plymouth Sport Suburban to work properly (as soon as I hit the highway, it would only go in reverse) after making my way back to the Vienna station, thus missing what amounted to a late third date with one woman...my eventual ex, another woman, accelerated her expressions of interest very soon after, and that seems like a pretty damned pivotal night in my life as a result. 8. I sparked a very informal anti-Vietnam War demonstration among fellow neighborhood kids at age six. We were riding around our Boston suburb in the back of an old firetruck (rather like a giant pickup truck), and I started everyone flashing peace signs and shouting for an end to the war. Seemed like a good idea. 9. My earliest memories of friends are of a girl, like myself aged 4, and her slightly younger brother, probably of Tlingit or Athabascan ancestry, who lived around the corner in Fairbanks, AK. I thought their mother remarkably beautiful. She was certainly very nice to me. Also of a boy of about 12, who was developmentally disabled and lived down the street...he had an enormous collection of Hot Wheels and Matchbox cars. He later was imprisoned for murder, a decade or so later, my parents heard from friends who still lived there. 10. While attending the University of Hawaii, I was elected to the lowest possible elected office in the state, the Student Senate. I was 19th for 19 positions for the College of Arts and Sciences, out of a field of 24 candidates...three of my friends and I ran, in 1983, as the Green Slate. 11. At 18, I believe I was the youngest editor so far of HAWAII REVIEW. I held that position for one month. 12. I was a National Merit Scholarship Semi-Finalist, who might well've achieved highest "selection index" (score) for the year in Hawaii, in 1981. At the assembly where the students were recognized for such things, my name wasn't called, to the bemusement of the other folks I'd done slightly better than; this was not the first nor last time that I'd been shown such a petty slight by that school or other assemblies of pompous folk. 13. I've always been good at such tests, and as a partial consequence have never put much faith in IQ tests as measures of intelligence, as oppose to of IQ test-taking ability. A similar test taken at about the same time could be broken down as Things You Can Do In Your Head, at which I went off the top of the results scale, and Things Requiring You Deal With the Outside World, in which I fell into the Bright Average classification. Mildly telling, I thought. 14. I tend to work too much, in low-reward, high-responsibility positions. 15. As a Type 2 diabetic (both sides of the family, though happily not my parents nor brother so far), I shouldn't drink. Not too tough, but I have a vicious sweet tooth. Alzheimer's on both sides, too, which terrifies me, if less so than it did in my 20s. 16. My ex, mentioned above, noted that I seemed to be able to talk to anyone, though I tend to interview people w/o realizing it, and that I was the only person she knew who actually didn't seem to care what clothes he wore. I think she was ambivalent about the latter...as, I suppose, am I.
http://www.thislife.org/Radio_Episode.aspx?sched=1277 at about 11 minutes in, is a segment in this "Numbers" episoode about poll-driven art. These folks devised some paintings and more importantly here two songs after the reults of several international polls. The popular-aspect song is a generic r&bish tune...the unpopular-aspect song is a wonderful mess, with an operatic soprano rapping, a children's choir singing about holidays such as Labor Day, bagpipes, tuba, banjo, etc. On a show usually dedicated to people pretending that insane behavior is unsurprising, often delivered by people whose voices are so nasal as to help Ira Glass feel his own is relatively normal, this is a delightful segment, particularly in the snatches played from the anti-hit. "Women are writing science-fiction! ... Women are closer to the primitive than men. They are conscious of the moon-pulls, the earth-tides. They possess a buried memory of humankind's obscure and ancient past which can emerge to uniquely color and flavor a novel. 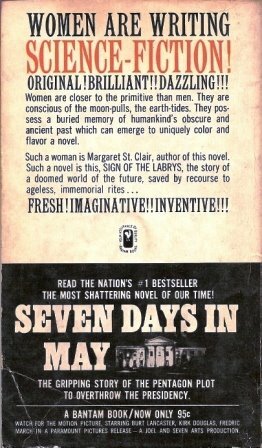 Such a woman is Margaret St. Clair, author of this novel. Such a novel is this, Sign of the Labrys, the story of a doomed world of the future, saved by recourse to ageless, immemorial rites ..."
Meanwhile, I think you can see why these books might appeal to any literate youth; this was, I'm pretty sure, my introduction to Borges (I wouldn't catch up to his new work till The Book of Sand a few years later; also to Lawrence and probably to Aldiss, Highsmith, and "Seabright" (slightly ironic that what is almost certainly St. Clair's best know story was published by her under her Magazine of Fantasy and Science Fiction pseudonym). The Aldiss is a slightly silly but ingenious account of a prison made up cells on a sort of wheel within a mountain, told in the great gray tones appropriate to such a narrative. The Highsmith is "The Snail Watcher," and I hope you've come across it somewhere in your reading life by now...easily the most famous short story published by the shortlived US fantasy and sf magazine Gamma, despite not being sf nor fantasy, but a potentially realistic animal suspense story involving the kind of obsessive Highsmith loved to describe (and one wonders why it ended up in Gamma rather than a higher-paying market...was it widely rejected? A favor to editor Charles Fritch, who later would edit the last years of Mike Shayne Mystery Magazine? The others are nearly as common chestnuts of such anthologies, and other sorts, except perhaps for the Calisher, which might well've been first anthologized, and spotted by Owen, in Ray Bradbury's Timeless Tales for Today and Tomorrow. 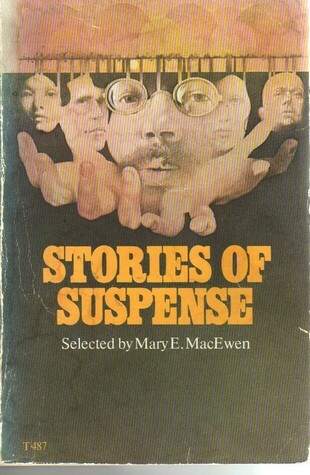 Stories of Suspense is one of a number of fine anthologies, albeit full of chestnuts in their fields, published for younger readers by the book-publishing arm of Scholastic Magazines, in the post-TAB Books, pre-Goosebumps/Harry Potter decades, when Clifford the Big Red Dog was probably their greatest single money-maker (Scholastic has claimed serious losses of late, but I find that difficult to believe). Mary MacEwen seems only to have published this one anthology with SBS, as opposed to the busy Betty M. Owen, who published at least three horror and suspense anthologies beginning a few years later, among a number of other sorts of anthology. Since I'm pressed for time at the moment, I will simply note that this an excellent collection that includes some horror (such as "Of Missing Persons," and arguably the Du Maurier) and some near-future/present day sf ("Flowers for Algernon," the novel version not yet published and some years away from being a classroom staple), but mostly stays in the proper wheelhouse, much like the much more sustainedly supported Robert Arthur YA anthologies, including the juvie "Hitchcock" assemblies from several publishers, and the ubiquitous Great Tales of Action and Adventure, edited by George Bennett (Dell Laurel Leaf). Or, for that matter, Hal Cantor's once ineluctable Berkley compilation Ghosts and Things. 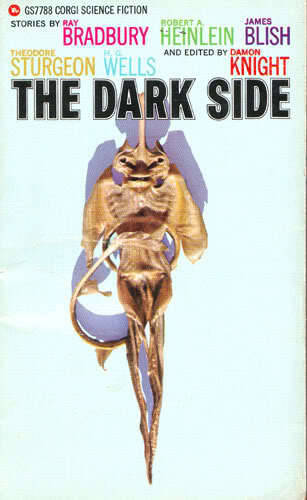 Seems to me it was an easy time to get hooked on short fiction in the '60s and '70s, wonder why so relatively few did. While there had been best-ofs of various magazines at that time--quite a number of nondefinitive collections from Weird Tales, at least three from Unknown, at least one from Fantastic, one each surveying Beyond and Fantastic Universe, and a long and up till then fairly regular series from The Magazine of Fantasy and Science Fiction, there hadn't been (arguably) a volume which concentrated on fantasy, rather than horror or more eclectic assemblies, through the decades of the fantasy magazines. 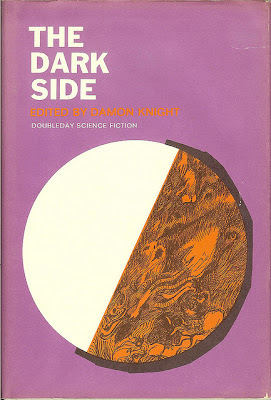 But there had been predecessors for which one can make the case that they were meant to do something very similar, and this book, the first fantasy anthology Damon Knight edited (although his magazine Worlds Beyond in 1950 had stressed fantasy in its mix of fantastic fiction), is certainly one of them. Fortunately or unfortunately, it was published by Doubleday in 1965 in its Doubleday Science Fiction line, which meant it was plastered with indicators that it was really an sf book, which it largely is not, and given a perfunctory cover and a claim on its jacket flap copy to contain "The October Game" by Ray Bradbury, rather than, as it does, RB's "The Black Ferris" (one of two stories it shares with the Carr/Greenberg antho from a decade and a half later). Knight himself, perhaps unsure that the sf audience that the book's being sold to won't simply snort or reflexively reject any collection of fantasy stories (this being the marketing dilemma for fantasy so labeled as Tolkien was only beginning to sell in the millions), at various points in the headnotes to each story the reader is reassured that these stories aren't Just fantasy, or, more foolishly, that they are Just fantasy and can be enjoyed as such, as if any but the most blockheaded readers (of which there were, and are, more than a few in the sf audience) couldn't figure that out for themselves. But, then, Knight seems to want to readers to know from the general introduction on in that his book is devoted to fantasy that follows the (uncredited) H.G. Wells rule for fantastic fiction, that there be only one miracle per story, and all must be rationally extrapolated from that anomaly. 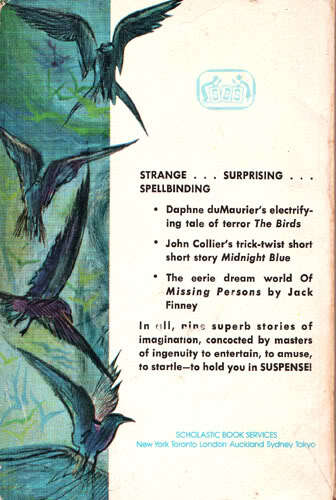 This was also the Party Line at Unknown (later Unknown Worlds), the fantasy magazine edited by the hugely influential science fiction editor John W. Campbell, Jr (whom it is widely suggested preferred editing Unknown during its four year run, and who ran some Unknownish fantasy in his Astounding SF, later Analog, after the companion folded). Having established that, Knight leads off with the Bradbury story, which he slights the rest of Weird Tales's entire inventory in favor of. While "The Black Ferris" is the seed of Something Wicked This Way Comes, it probably isn't even the best story Bradbury published in Weird Tales, and Knight's review of Dark Carnival, the first Bradbury collection, suggests as much (that review can be read in Knight's collection of reviews, In Search of Wonder, a touchstone of SF criticism and a book I reread several times as a youth). It's written in Bradbury's usual slightly too lush style of his early mature work, but in doing so shows the influence of two of his great models, more blatantly so in this story than in many, the more precise Theodore Sturgeon and the progenitor Nathaniel Hawthorne (I can see this being written in part as a response to "Dr. Heidegger's Experiment"). So, one can see that there's one story from Weird Tales, three from Unknown, one from the primarily sf magazine Startling Stories, four from Fantasy and Science Fiction, and one each from Beyond Fantasy Fiction and the general-interest magazine The Idler (a solid Wells market), and a story Leiber published in his first collection, Night's Black Agents, which was otherwise drawn from magazines...pretty darn close to a survey of the fantasy magazines, even if limited to a slice largely through the same sort of thing that is often called "urban fantasy" or contemporary fantasy today. Knight was a not-uncritical but generous fan of Robert Heinlein, and overstates the effect of RAH's "They" on the reader (at least this reader, and I suspect most who were not introduced to the notion of solipsism by this story, as perhaps the young Knight was...a comic-book ripoff of Theodore Sturgeon's earlier "The Ultimate Egoist" was my first experience of same), but it remains an enjoyable story. Which is arguably science fiction, in this ostensibly non-sf anthology. James Blish's "Mistake Inside" is an improvement, an early display of Blish's lifelong Anglophilia, fascination with history and with the basic questions of religious faith and the necesary grappling with morality and ethics that springs from that questioning...a mostly giddy alternate reality adventure with a deft ending. Not a major story, but certainly working up to one. H. L. Gold's "Trouble with Water" is the other story shared by the Carr/Greenberg, and is certainly the best story I've read by Gold, though several others come close. Gold, like Alfred Bester, was a man with his finger on the pulse of popular culture of his time to a degree that no current person in the SF world can quite match, as far as I can tell...and in Gold's case, as Algis Budrys suggested at least once, that degree of understanding inhibited his best work (and Knight himself, in a review of a Gold collection that included How I Wrote This notes from Gold, quotes bits of his thought process that would've improved the story if more fully incorporated)...even here, the stereotypical shrewish wife, as cleverly as she's drawn, is not redeemed from cardboard by her eventual change of heart, in large part due to how well Greenberg the protagonist is presented as a full human being, and how the other characters are gracefully sketched in as much as needed. It's a story of a man who incautiously offends a "water gnome," and is in turn cursed by the supernatural creature with being unable to touch water. It's a classic, if not a perfect one, but eminently worth reading. Peter Phillips is everyone's favorite near-forgotten writer of fantastic fiction in the 1950s, showing up also in such anthologies as Ramsey Campbell's Fine Frights, and "C/O Mr. Makepeace" is another fine if not superb, and elaborate, exercise in linking the notion of poltergeists to older forms of haunting. Knight helpfully (or not) keeps noting how many of the stories he's chosen loop back to either time-travel or solipsist/identity-question themes. Avram Davidson's funny and widely anthologized borderline sf piece "The Golem" follows, wherein the stereotypical elderly Jewish couple, who are faced with a new sort of Frankenstein's monster, are wonderfully fleshed out, as is the ineffectually menacing automaton. Not Davidson's best story in this mode, but good and probably his most famous. H. G. Wells's "The Story of the Late Mr. Elvesham" is very well-written, rigorously worked out, and too long, given that even in 1896 this story of an older man possessing the body of a younger one would not be terribly fresh. But, like every other story in this book, it uses its excellent detail tellingly. 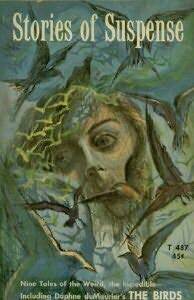 Theodore Sturgeon's "It" was probably his masterwork, in the sense of his first fully worked-out story that can't be notably improved in any particular. I've been surprised in recent years to learn that some folks aren't too impressed by this persuasive horror story, which could be called sf only by stretching that term to its breaking point, but which is utterly convincing as horror fiction to its devastating last lines. Anthony Boucher's "Nellthu" is simply the most memorably funny deal with a devil vignette that I've read, one which has stuck with me through the decades. Richard McKenna's "Casey Agonistes" was his big splash in fantastic fiction, and Knight wants to warn us that it's arguably not fantasy at all, and it is a borderline case...which makes more sense on the fantasy side of the fence, dealing as it does with the shared hallucination of a ward full of dying men. McKenna made a bigger splash with the bestselling historical novel The Sand Pebbles and died too young shortly after. T. L. Sherred's "Eye for Iniquity" is a brilliant contemporary fantasy about a man who learns he can duplicate money by simple concentration on the bills as they lie on his coffee table. Sherred was never prolific, but more than nearly anyone else in the magazine field could make one feel the lives of the working people in his stories. So, basically, this is not a definitive anthology, but one which contains not a few brilliant or near-brilliant stories, and no actively bad ones. The second half is better than the first, but I have to wonder if I'm letting nostalgia overtake me in at least a case or two, as Knight does with "They." I doubt it. A fine thing to seek out in the secondhand market or interlibrary loan, perhaps along with Knight's horror/suspense/sf anthology A Shocking Thing, published a decade later...the two of them together might make an interesting comparison to the Carr/Greenberg, or Robert Silverberg (and Greenberg)'s poll-driven The Fatasy Hall of Fame. The Fantasy Hall of Fame ed. Robert Silverberg (HarperPrism 0-06-105215-9, Mar ’98 [Feb ’98], $14.00, 562pp, tp); Anthology of 30 fantasy stories from 1939 to 1990, chosen by SFWA members. Introduction by Silverberg; individual story introductions by Martin H. Greenberg.